Dark Road to Darjeeling by Deanna Raybourn, a Mysterious Review. 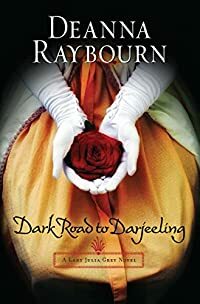 Review: Lady Julia Grey, now Lady Brisbane after her marriage to detective Nicholas Brisbane, travels to a picturesque Indian village in the foothills of the Himalayas to investigate murder on a tea plantation in Dark Road to Darjeeling, the fourth mystery in this series by Deanna Raybourn. Lady Julia and Nicholas have been honeymooning in the Mediterranean for the past eight months, but both are getting restless for action, longing for the excitement and challenge of a new case. When Julia's sister, Portia, invites them to India, they jump at the chance. Portia's former lover, Freddy Cavendish, now married and owner of The Peacocks, a vast tea plantation, has been murdered. when Nicholas is detained in Calcutta, he advises his wife against rash action. "A woman's importance comes from who she is whereas a man's importance come from what he is." Clearly he doesn't want her to do anything that might jeopardize her safety — she being unskilled and unschooled in the ways of defending herself. Yet Lady Julia does continue on to The Peacocks, determined to begin an investigation, with or without her husband. She wants to prove she detect all the while taking care of herself, thank you very much. There is no shortage of potential suspects who may have had a reason to want Freddy dead, but Lady Julia narrows her focus to two who stand to gain the most from his death. With no direct male heir, Freddy's cousin, Harry Cavendish, and his aunt, Camellia Cavendish, would stand to inherit his estate. Though a murder mystery is at the core of Dark Road to Darjeeling, the heart of the book is in the delightful relationship between Lady Julia and Nicholas, a most appealing story in and of itself. Nicholas is over-protective of Lady Julia — and a little envious of her intuition and skills of deduction and the fact that people, for some unaccountable reason, tell her things, useful things, that they won't tell him — while Lady Julia is independent, impetuous even, eager to demonstrate that brains are as important as brawn in solving a case … especially one involving forbidden affairs, malevolent scandals, and twisted birthrights. With romance, danger, and intrigue aplenty, Dark Road to Darjeeling is really quite a treat. Special thanks to guest reviewer Betty of The Betz Review for contributing her review of Dark Road to Darjeeling. Acknowledgment: Nancy Berland Public Relations provided a copy of Dark Road to Darjeeling for this review.